There had always been something different with Saturdays. If days of the week had color, it would be the color yellow. It always looked so warm and very anticipating. As a kid, I used to remember one of my weekends being spent in a place far away from home. My family and I would spend it in Apalit, Pampanga, where we attend our weekly Thanksgiving ceremony. I must have been somewhere between five or six years old then, when I would distinctly remember the homey scent of rice being cooked wafting through the bathroom as my mother splashes me with lukewarm water. It was 3:00am in the morning, but I was the least bit sleepy. By 3:30am we would be cruising at the dark road ahead of us, illuminated only by the orange-colored expressway lamp lights and the dimly-lit moon. I would fall asleep resting my head on a pillow that nestled in one of my Kuya’s laps. At 6:00am we would be eating hot sopas with some cheesy puto or butter-smeared hotcakes on our monoblock chairs near the front of the stage. And then my mother would spread half a blanket on the cement floor and make a make-shift bed for me, and she would make me lie down and close my eyes as I listen to the heavenly singing of the Music Ministry as the ceremony starts. I may have fallen asleep during the opening parts of the ceremony, but I would extremely be wide awake during the part where brethren would come up on stage and offer thanks to the Lord. When it was our time to go up the stage, my dad would place me on his shoulders and I could see all of the convention center, which was smaller back then. Then I would hear the rhythmic beats resounding, and the brethren onstage dancing and singing praises to God. 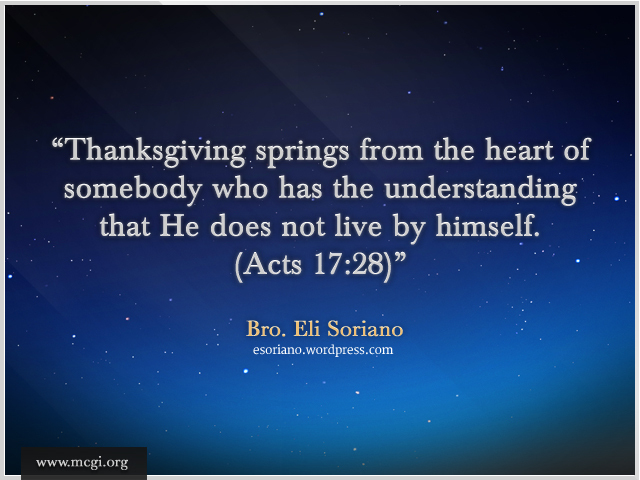 Then brethren would enumerate numerous reasons why they give thanks to the Lord – some of them were given jobs, some of them were cured from sickness, some of them were celebrating their spiritual birthdays. Then there were those who thanked the Lord for being fired from work, for failing exams and even for losing a loved one. “Why do they do that, Papa?” I once asked my Dad. And he answered that brethren still offered thanks despite the seemingly bad things that happened because it was what Bro. Eli and Brother Daniel had taught us – to give thanks in all circumstances as written in 1 Thessalonians 5:18, and because it was God’s will and things will work together in the end (Romans 8:28). Fast forward to eleven years, and here I am, with God’s help still awaiting the coming of Saturdays every week. When I was younger I didn’t fully understand yet what it meant to give thanks to the Lord, but now that He has called me into His fold nearly two years ago, I learned to thank Him for everything He has done in me and my family’s life. I thank Him for the wonderful fate that He has given me, that I grew up and was brought up inside His true Church, and that I was given the highest calling and duties that give meaning to my life, duties I sometimes think I don’t deserve. But with His loving kindness and mercy He urges me to go on and do my part, to someday be with Him in paradise even if I get to stay in a little corner. I thank Him that I can write, even though I am fully aware that no words would describe what I am feeling and that words will never be enough to express my gratitude. But I thank Him still, for everyday of my life that I am able to open my eyes and be able to reach another Saturday.